RoboCup is an international robot soccer competition whose aim is to encourage advanced research in mobile robots. There are four different leagues for different types of robots. One of the leagues is the Sony legged robot league. CSE@UNSW has entered teams in the 1999 competition in Stockholm and the 2000 competition in Melbourne. In 1999 we were runners up and in 2000 we blitzed the opposition to easily win the championship. In 2001 at Seattle we defended the championship in an exciting final against CMU. They got us back in the 2002 final in Fukuoka, Japan. So now its up to the 2003 team to regain the title for UNSW. We are now recruiting the team for the 2003 competition which will be held in Italy. In 2002 there were 19 teams from some of the top international robotics laboratories. We are looking for outstanding students who will continue UNSW's great record of four finals in a row and regain the world champoinship. This is not a project for the feint-hearted. It requires a lot of work, imagination and excellent programming skills, but if you are up to the challenge, it can be very rewarding. In the Sony legged robot league, all teams compete with the same hardware, supplied by Sony. The difference between the teams is the software they write to get the robots to play soccer. Each robot is fully autonomous, with an on-board colour camera, gyroscopes and accelerometers, infra-red and contact sensors, speaker and stereo microphones. Programs are written in C++ using a PC-based development environment. Code is loaded onto a memory stick that is inserted into the robot. After that, it's on its own. 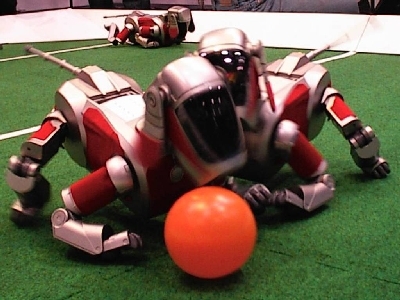 How does a robot recognise the objects on the field, including the balls and goals? How does a robot recognise another robot on the same team and the opposing team? How does a robot figure out where it is on the field in relation to other objects? How should robots on the same side communicate and plan their actions? How should the robot plan its actions? How can a robot recognise the plans of the opponent? 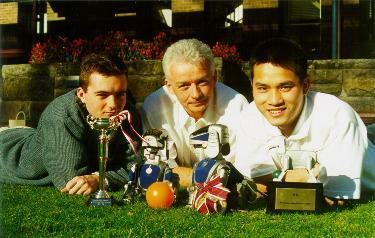 The 1999 UNSW United team consisted of two CE thesis students (John Dalgliesh and Mike Lawther) who laid the foundations of the project by developing a new way of training the robots to recognise the colours on the field, needed to identify the different objects. They also worked out an internal representation of the world and a way of localising the robots. The other teams consisted mostly of full-time research staff and PhD students from such places as Carnegie-Mellon University (CMU) and the Laboratoire de Robotique de Paris (LRP), the eventual winners. They were more than a little surprised when John and Mike, mere undergraduates, finished runners up! The 2000 team members are Bernhard Hengst (PhD student) Darren Ibbotson and Son Bao Pham (CE thesis students). Taking up where last year's team left off, Son, Darren and Bernhard improved the vision and localisation, developed completely new routines for locomotion and worked on game playing strategies, including making a start on some simple team work. They did such a good job that UNSW's team was in a class of its own in the competition. The smallest winning margin was 10-0 in the final against LRP. On the first day of competition, we had a practice match against CMU, winning 12-0. After that all the other teams knew they were competing for second place! If you think you are up to the challenge of following in the fine tradition of the last two years, please contact me. Groups Three or four students.